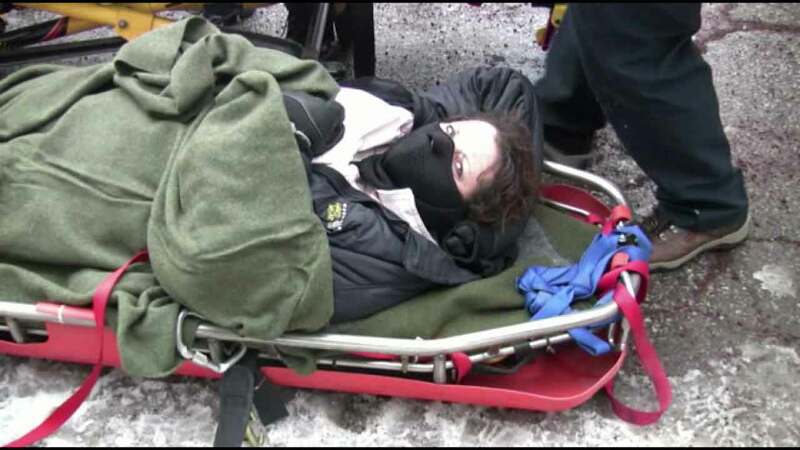 A woman found alive after going missing near the Mountain High resort in Wrightwood on Sunday, Jan. 10, 2016. WRIGHTWOOD, CA -- A 51-year-old woman who was lost in snow near the Mountain High resort in California overnight was found alive on Sunday. The unidentified woman was found injured but "conscious and coherent" at the Table Mountain campground area and was extracted via a snowcat vehicle before she was transported to a hospital, according to a press release from the Los Angeles County Sheriff's Department. The victim's son called the sheriff's Palmdale station around 2:40 a.m. and reported his mother missing from the Mountain High ski resort. It was unclear how she became lost, but authorities believe she had apparently gone to look for someone. Deputies said the woman sent a text to her son in the early morning saying she was lost and walking around in the snow with no shoes or socks on her feet. Her son drove to the resort and found his mother's vehicle in the parking lot, but could not find her. He called rescuers who were able to focus on the area where the woman's cell phone was last active. Hours later, they found her near the amphitheater, conscious and alert. "Found mom in Wrightwood: LA Sheriff trackers had found her shoes & socks in snow. Rain washed away tracks," read a retweet from the official LASD Twitter account. The woman's condition was not immediately known.